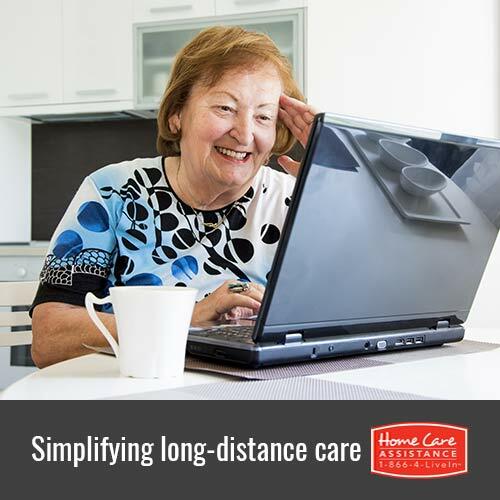 Can Long-Distance Caregiving Be Made Simpler? Providing care for a senior loved one can come with many challenges, and living many miles away from him or her can make it even more difficult. However, the tips below can help simplify the situation and ensure your loved one receives high-quality care. Handling your loved one’s complex affairs from afar can be overwhelming and challenging, but having a plan in action can help simplify this process. The plan should detail a system that keeps everything in order, including doctor visits, emergency contacts, bills, activities, and the name of the family member or in-home caregiver who will handle those priorities. It is also a good idea to put the plans into writing to help reduce the risk of misunderstandings. Even if you have hired a part-time or 24-hour caregiver in Guelph, you may still need to divide certain caregiving duties among you and other family members. If you share the responsibilities as a team, you will all be better prepared for problems that may arise. The duties can be divided based on location, skills, and interests, and you may need to rotate these responsibilities from time to time. It is best to include your loved one in this process as well. Allowing your loved one to have input pertaining to his or her care can make the caregiving process go smoother. Sometimes providing personal care for your loved one is not an option and you will need to hire a professional. Using Guelph in-home care services allows your loved one to stay at home instead of going into a retirement or nursing home facility. Knowing your loved one is able to live in the comfort of home can make living far away from him or her less stressful. You will also feel better knowing your loved one is receiving care from an expertly trained professional. Personal connections are truly valuable, but being far away can make these connections tricky. This is why you should meet your loved one’s in-home caregiver and stay in touch with him or her. A Guelph in-home caregiver will be heavily involved in your loved one’s care, so you will need to speak with the caregiver on a regular basis and have as many face to face meetings as possible. With the advances in technology, you can also stay connected through email, text messaging, phone calls, social media apps, and more. Consistent communication shows the caregiver you are truly interested in your loved one’s wellbeing, which could result in even better care. Though living far away from your loved one can make it more difficult to provide high-quality care, you don’t have to take on this challenge alone. For trusted hourly and live-in care, turn to Home Care Assistance. Our caregivers are available 24/7 to help your loved one with a wide array of daily tasks, including exercise, cooking, bathing, and light housekeeping. For more information on how our in-home care services can keep your loved one safe and healthy, call one of our qualified Care Managers at (519) 954-2111 today.